She's the woman who, as a young girl, watched her father kill her mother with a pair of scissors. He's a man who has never come to terms with his tortured childhood. They used to be married, are now divorced and probably still love each other. Elizabeth Banner, a brilliant geologist, has come back to Virtue Falls for the first time since her mother's murder 23 years earlier to continue her father's study of the geologically rich coastal area of Washington and to confront the man who brutally murdered her mother all those years ago. Her mother's body was never found and the adult Elizabeth wants answers to questions she seems unwilling to ask. Slowly losing his memories to Alzheimer's, her father has been released from prison and now resides in a Virtue Falls care facility yet Elizabeth continues to resist digging into her father's memories. What does she fear? Nothing is going right for Garik Jacobsen. An FBI agent to his core, he's despondent over being suspended due to his actions on a recent case, bewildered by Elizabeth's departure from their marriage, and fearful of the man he believes he's becoming. He has nothing left to live for. With his favorite meal and his service revolver on the table before him, he's prepared for one final, irrevocable act. Then an earthquake hits Virtue Falls. A tsunami soon follows. Garik rushes to Elizabeth's side. And when the earth gives up secrets that have been buried for 23 years, it will change them and the course of life in Virtue Falls forever. For as Elizabeth and Garik slowly come to realize after Elizabeth's mother's body is found; if what they and the courts believed to be true was false, if Charles Banner did not kill his wife, then who did? Does a killer walk among them? Will that person strike again? And most important, who will the next victim be? As this is the first in Dodd's new series, it necessitates the introduction of a rather large cast of characters yet I never felt lost or confused. Rather, it was like moving to a new town and gradually getting to know its residents: the good, the bad, the quirky and the seriously demented. They are not just window dressing. Each person introduced has a role to play, a purpose, as the foundation is carefully constructed then, slowly, truths begin to be revealed, evil insidiously weaves its tentacles throughout the small town of Virtue Falls and, finally, the story races to its breathless, stunning conclusion. It's an incredible ride; one I'd happily take time and time again. I've been reading Christina Dodd's books for more than 15 years and I have to say, I think this is her best writing yet. While not technically a romance, the story has a strong romantic thread at its core and should appeal to fans of both romantic suspense and straight suspense. It's tightly constructed, expertly plotted and filled with enough twists and turns to keep even the most astute mystery reader guessing until the very end. Dodd draws the reader into her web of suspense one silken strand at a time until you're so entangled in the story and the lives of its characters that you can't walk away. Nor do you want to. Virtue Falls earns my highest recommendation. Virtue Falls is available in print, e-book and audio. Can't wait to read this. I have it on hold at the library. Be sure you have a clear schedule before you start reading. You will not be able to put it down! PJ, to what books would you compare ? Like you, I'm a Christina Dodd fan from way back and have followed her from subgenre to subgenre, including her paranormal series, even though I almost never read paranormals. I had planned to skip Virtue Falls because I avoid serial-killer books as a rule, but your review almost persuades me to give it a try. On a scale of 1-10, with 10 being saturated darkness, how dark is it? 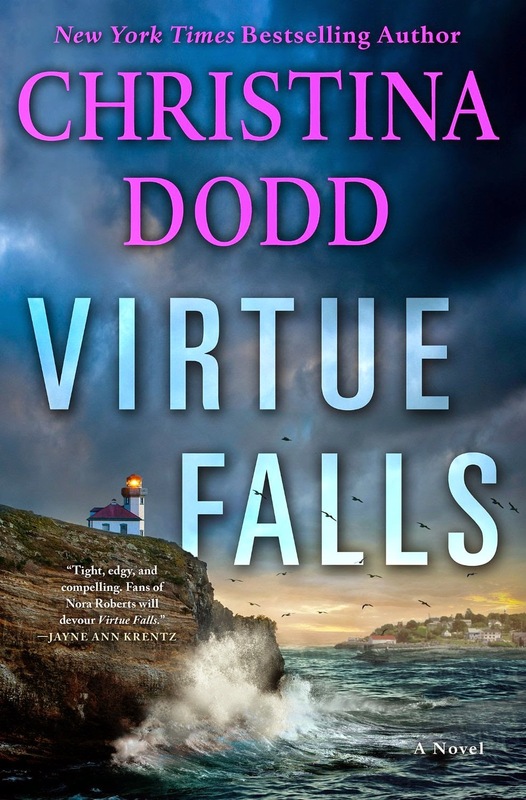 Janga, Jayne Ann Krentz compares Virtue Falls to suspense thrillers written by Nora Roberts, Iris Johansen and Sandra Brown. I would agree. The first chapter is dark as is the end of the book but the rest of it is very character driven with taut suspense but very little graphic darkness. It drew me in and kept me riveted throughout but didn't leave me looking over my shoulder or unable to sleep afterwards. Hope that helps. The stand-off between Christina Dodd and Blogger continues. She sent me a comment and asked that I add to today's post. Thank you, PJ, for the great review. You made my week. VIRTUE FALLS is a beautiful package and I hope everyone enjoys the story of Elizabeth and Garik and the whole town of VIRTUE FALLS! I've been hearing such good things about this story - sounds like something I would enjoy - thanks. I can hardly wait to get my hands on this book but I am number 5 and they only have one copy hope the others are fast readers...I love her romance suspense books. YOur review was great. This book sounds like it is guaranteed to keep the reader on the edge of their seat. It's on my Wish List. I enjoy her books. I read suspense before I read romance of any type and look forward to this one. It sounds like a good story and your high recommendation makes me eager to read it.